This book is not a “dark” crime story, although the corpses are in abundance. The main merits of the novel, as every other work of Joanna Chmielewska, are an inimitable sense of humor and self-irony. The author is able to notice the grotesque even in the most tense situations. 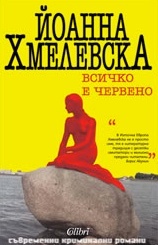 The novel “Everything is red” is rightly recognized as one of the most brilliant and dynamic works of the Polish writer. Joanna Chmielewska was born in 1932 in Warsaw (Poland). She was brought up by her mother, grandmother and two aunts who taught her to love the literature. Despite that she studied archtecture. Later on she became one of the most read and translated Polish authors. Her first story was released in a newspaper in 1958 and her first novel, "The Wedge" was published in 1964.